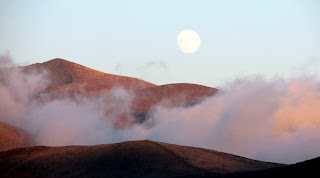 Walking the hills of Corca Dhuibhne you find tumbled forts and gravesites, ancient mounds and stones, marking the lives of people who lived and died here under the panoramic sky. Some sites, nearer the tourist routes, are fenced and gated, hemmed in by car-parks and neatly-clipped fuchsia hedges. Others, in higher places, lie among plantain and tiny, pale-green wildflowers, lost in grasses and smothered by briars. Among them are single standing stones, some tilted in the boggy earth, with parallel grooves of different lengths scored along their sides. 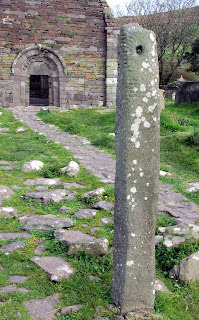 Some are carved with crosses or single or linking whorls, etched in grey and yellow lichen. Exposed in high fields, they seemed forgotten, except for official notices warning against vandalism. Sometimes they're tilted in deep ruts carved by grazing cows. Many are gravestones. But where the sun warms the weathered stones they strike warmth back when you lay your hand on them. It's hard to believe that the earth beneath, cold and wet in the deepest places, holds smooth and ancient bones. In some places you find straight rows of single standing stones, called 'stone alignments'. They're monumental calendars in the landscape, marking seasonal turning-points in the year, sites where people once came together to celebrate and promote the endless stream of energy which, according to their world-view, held the universe in balance. 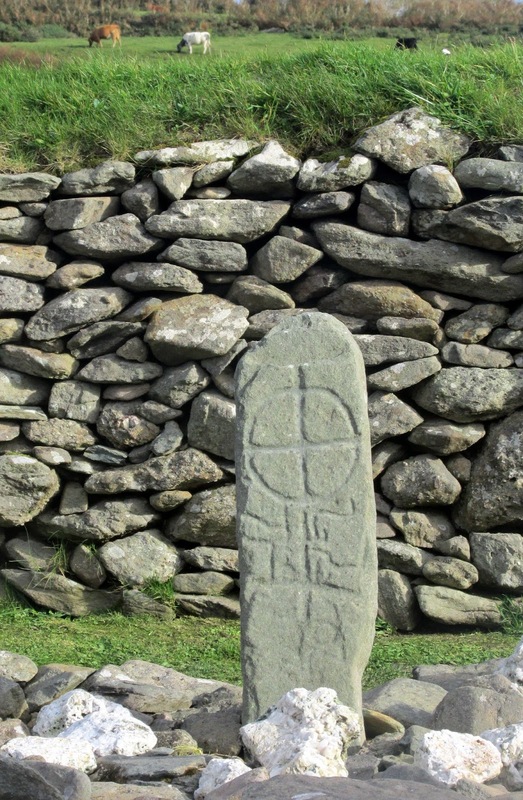 There are two stone alignments here in Corca Dhuibhne. 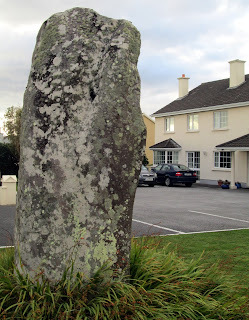 One - orientated on the rising sun on midsummer's day - is near the village of Cloghane, on the far side of Mount Brandon from the house where I'm writing this. 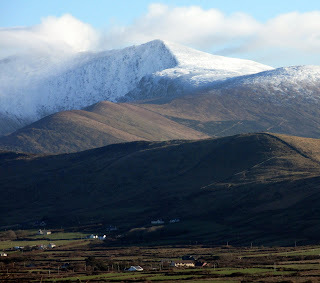 The other's on our side of Mount Brandon, at Ardmore, near Lispole, just beyond Dingle. The Ardmore site marks the winter solstice. Three standing stones line up on an elevated view of the landscape that stretches from Lispole in the east to the western tip of the peninsula, where the Atlantic Ocean meets the cliffs. They're orientated on the point on the horizon where the sun sets each year on December 21st. In Ireland, the season of Samhain was also the time when the Good Goddess was pregnant with the promise of springtime and longer, lighter days. 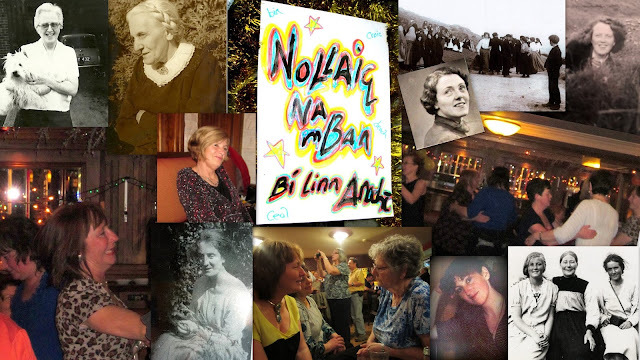 So, to the ancient Celts, winter feasts and gatherings were demonstrations of confidence in the future. In the darkest days and nights of the year they celebrated sunlight to come. When the sun rises on December 22nd, the days will begin to get longer. We may still get snow before we get through the winter. But as the evenings get lighter, sap will start to rise in the hedgerows. And soon the earth and the air will smell of spring. Thanks, Mark. You couldn't have said anything I'd value more about my writing about Dingle. Paring stuff down and trying to present the essence under the lushness is my favourite part of the exercise. Best, Felicity. I can picture the whole scene! I love how you describe it all Felicity, so beautifully and with feeling. I've noted these places, hoping to visit on our next trip to Ireland, which could well coincide with next years Winter Solstice. Thanks for your gifted writing which makes it come alive for me on the other side of the �� world. Happy Christmas!